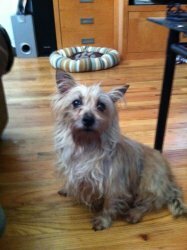 Petfinder Adoptable Pet #4: Alexa, a Staten Island Stunner | Will My Dog Hate Me? Is it just me, or does this picture make Alexa look like an angel — you know, with the donut shaped bed hovering like a halo over her head? Alexa came from a puppy mill and so is still learning to trust, so she needs a little TLC from people but has no problem with other dogs. I’ll just say this: If I still lived in New York City, Frankie might very well have to share his home with Alexa (who could be his first cousin, but we don’t have to worry about that). I saw the halo right away! She is a cutie for sure.